We were welcomed by another wet and rainy morning at Lake Lagunitas, but Tender Trackers are professional rain-rompers and were unfazed by the damp day. We started by meeting the butter churn that would help make our morning snack. Ruby reminded us of the story from last week about Sean O’Hoolihan and Mrs. O’Malley and making ‘gold’ in the butter churn. All of the children got many a turn at the churn, chanting like Sean in the story; “Chuggity clump! Chuggity clump! I’m making gold – a great big lump! !” It took all morning of taking turns among me, Ruby and all of the children, and by snack time we had a delicious lump of golden butter to spread on fresh bread. It was truly a treat and there was much appreciation for the hard work, time and effort spent on making it. Miles and I made an obstacle course from some found objects and added some sticks, logs and rocks. We invited our Tender Tracks friends to try it out, and everyone had their own style of hopping, walking and balancing through the course. Charlie and I found a banana slug and a newt and then made a small forest home for a creature. She spent a lot of time on the details of arranging sticks for a mattress, small stones for seats, and finding moss for food. Any small creature would be cozy in the home she built. Rohan, Blake and Miles used sticks to test the depth of the creek and searched for newts. Blake found a long, curved stick for ‘catching’ and herded his friends with it in a new game while Violet, Siena and Margot played princesses in the forest. We headed up the spillway steps to explore and see if there were any turtles. No turtles today, but we did have lunch at the table overlooking the lake. It got cold and rainy during lunch so we decided to go play some running games down in the coverage of the trees. We played ‘fire in the forest’ again and chose our animals and took turns asking questions and running from Ruby and other friends. Then some children started a game of ‘duck, duck, goose’ while Violet suggested ‘hide and seek’ so Violet, Rohan, Miles and I started to play and soon the ‘duck, duck, goose’ crew came to join in! Violet began by counting and Ruby, the children, and I all hid. When Violet found me first I burst out and began to run away, but she corrected me that when she finds someone, they then help find the others. So that’s what we did. It was the sweetest game of hide and seek I’ve ever played. We played a few more rounds and in the last round, none of us could find Ruby! Charlie had the idea that we should hide from her, and if we had more time, I think we all would have hidden in the forest (I am curious how long they’d all hide from each other!) But we didn’t have to worry about losing Ruby because Miles and Blake found her! Back on Juniper Rose, snuggled under blankets, we shared all we loved from the day, including newts, a banana slug, good friends, rain and, of course, a lump of gold to eat! We hope you all enjoyed the fresh butter we sent home with your Tender Tracker! There were many mushy mud puddles to play in and Blake had an encounter with the Mud Monster which filled his boot and sucked it right off his foot! It was a funny and exciting experience and I got Mud Monstered too as I helped him un-mud himself. After a quick sock change and a plastic bag for protection, he was back at play. And after some mud removing of my own, so was I! As the morning went on, Ruby, Miles, Blake and Rohan found rocks by the creek to grind and make into paints. Did you notice any painted faces when you saw your Tender Trackers later in the afternoon? Siena, Violet, Margot, Charlie and I were searching for mushrooms while avoiding Evil Queens and stumbled upon a Newt! It was so exciting to hold our new friend and take it back to the trickling creek above the spillway. We set it free in the water and watched it cross the stream and climb the bank. Soon the boys joined us and we shared about our new Newt friend. We went to circle in a snakey rainbow line and sang our way to our special mats and symbols. At snack and story time we realized that Trippy Troopy and Trilly Truly were not in their little home and must be out on another adventure. The children all took to the woods to find their new hiding spot. Trilly Truly and Trippy Troopy were quickly recovered after the children’s search and we settled in for a delicious snack and cozy story. For the day’s adventure, we went in search of more newts around the lake! 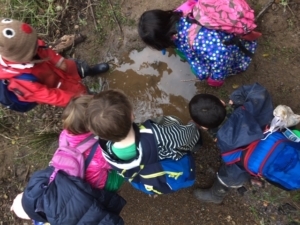 We found more trickly water flowing into the larger lake and followed their flow upstream to seek out more newt friends. On our way we met some banana slugs, and Rohan found an exceptionally long one! We played with rhyming and decided that ‘a newt is cute’ and ‘watch your boot’ (so we don’t squish them!) 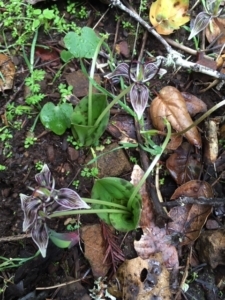 Along the way Blake, Charlie and I also spotted a mysterious plant with spotted leaves and a flower with three striped petals, then we saw some bright orange mushy fungus and a pencil poked in the ground, looking like it was growing there! Finally we found some newts in a quiet stream. Some were swimming or trying to hide or just floating in the water. We kept on the lookout for more newts as we continued to explore a bend in the big creek. Charlie found a stick to go ‘newting’ with (like fishing, but for newts, she explained.) There were lots of branches for floating and some shallow areas that were fun to run through. We had lunch under the cover of the Redwood tree canopy and chatted about similarities in lunches (carrots! peanut butter and jelly sandwiches! cheese!) and lunch boxes (space themed!) and why oranges are called oranges but carrots (which are also orange colored) are not. We began our journey to return to Juniper Rose, spotting even more newts on our path. Some critters we moved out of the trail to safety. On our way back, some of the children turned into rocks and Charlie and I had to find them and wake them up out of their rock sleep, and we observed that a few of the rocks were very giggly and ticklish. When we got to the bus, we peeled off our rain layers to snuggle under blankets and all of a sudden the rain children began to dance on the roof of Juniper Rose! 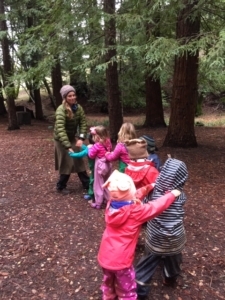 We shared our gratitudes of the day by making hand motions to symbolize what we enjoyed; like four fingered ‘high-fours’ for the newts, three finger flowers for the mysterious bloom, and two wiggly fingers to make banana slug tentacles. We were also very grateful for warm blankets, a cozy bus, and wonderful people waiting for us at Peri Park!